This flavorful chicken dinner requires just a few minutes time to prepare. The hardest part of this recipe is waiting while the chicken slowly cooks on its own. Pour the oil into a large stainless or cast-iron skillet over medium heat. (A non-stick skillet will work as well, although it isn't required.) 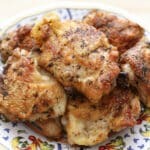 Generously sprinkle the skin side of the chicken thighs with spices and then place them in the hot skillet, skin side down. Sprinkle the other side of the thighs and then, without moving them, cook uncovered for about 20-25 minutes. Let them cook until the fat has rendered and the skin is deep golden brown and crisp; this could take as long as 30 minutes. If the skin is sticking to the pan, it likely isn't finished on that side. Reduce the heat as needed if the skin starts to burn before it is evenly golden brown. Turn the thighs over and continue to cook for about 20 more minutes. When the meat closest to the bone is cooked through, the chicken is done. Enjoy!